On Bradstreet: Make Way For Limulidae! It's the beginning of Memorial Day weekend, and it's Maine, so you know what that means-very old visitors, and not the sort in golf shorts and sun visors and black wrap-around shades. I mean so old that your closest biological cousin is an extinct creature, usually found in the fossil record. Now think about 200 million years. That's how many years horseshoe crabs predate dinosaurs! 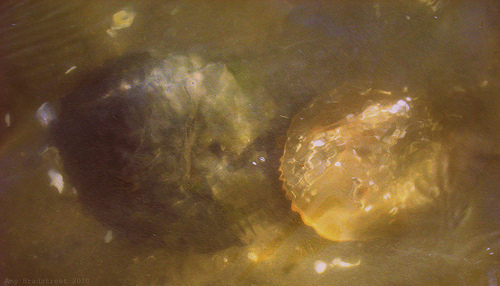 Horseshoe crabs, which aren't actually crabs at all, but belong in the same class as spiders and scorpions, spawn annually in a few shallow estuaries in Maine. They arrive with the full moon in May to mate, piling onto each other in the shallows, disappear, then arrive again to lay eggs with the new moon in June. Where they go after that, no one really knows for sure. Somewhere in the ocean is about as good a guess as it gets. And they've been doing it for a good 500 million years or so. 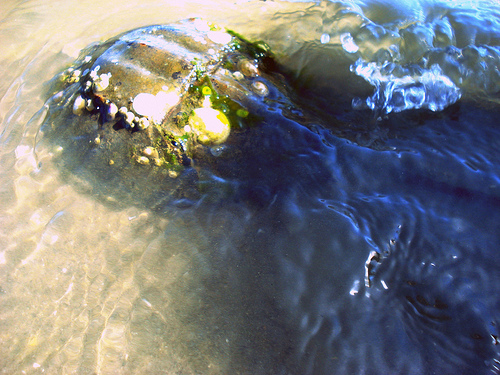 I still remember seeing the horseshoe crabs at Thomas Point Beach when I was a teen, and how amazing it was to see long chains or groups of them in the water at the shore. We didn't see quite the same spectacle today, but I'm hoping we might see it next month when they return to lay their eggs. We did find some, however. Most were half-buried in the clay and sand. The can be very quick, so we tried not to startle them. It's best to not touch them. The are harmless, but it's their ecosystem. We did it quickly and we only bothered this one that was alone, just to take a quick peek at it's underside, then we replaced it. Some had seaweed and barnacles growing on their shells. What an amazing thing it is to witness this annual celebration of life from a creature who's been doing this whole life thing, for 500 million years. And I think they are much better dressers than those other visitors in golf shorts. Thanks for sharing this information and your photos! Very cool. This is amazing! Thanks for sharing your experience. I had no idea that they were that big. I will have to read this to my little ones tomorrow. They will love it! Very Cool, I'll have to take my kids to the beach in June and see what we see at the sea! Thanks for the comments, All! If we had waited around until closer to high tide, which was 10pm, we probably would have seen more. Yes, they can get quite large. The one with the seaweed growing on it was 11"-12" around. It's funny to see the large ones with the itty bitty ones "attached". 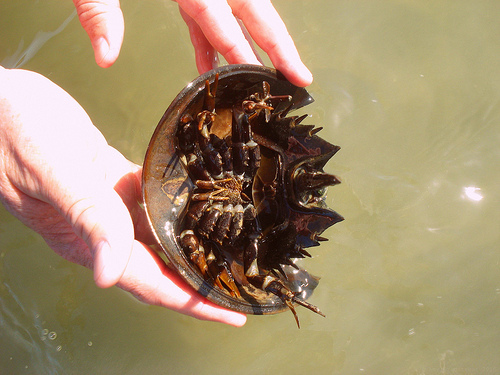 Good luck searching for horseshoe crabs! We are participating in a HSC survey. Have you seen any with tags? @Mom of 3: We did not see any with tags. I was reading about the tagging program happening at other beaches. It would be hard to tell on some of them that had seaweed growing on them; also I did not know they moved slowly enough for Mussels to attach to them!